Distribution and habitat: Capsicum annuum is a species native to southern North America and northern South America. Seeds was brought to Europe and Capsicum annuum began to be planted extensively in Portuguese colonies in Africa, India and Asia. Their popularity continues to grow across the world due to their ease of cultivation, frequently sharp taste and attractive appearance. It is now grown around the world, both commercially and domestically. 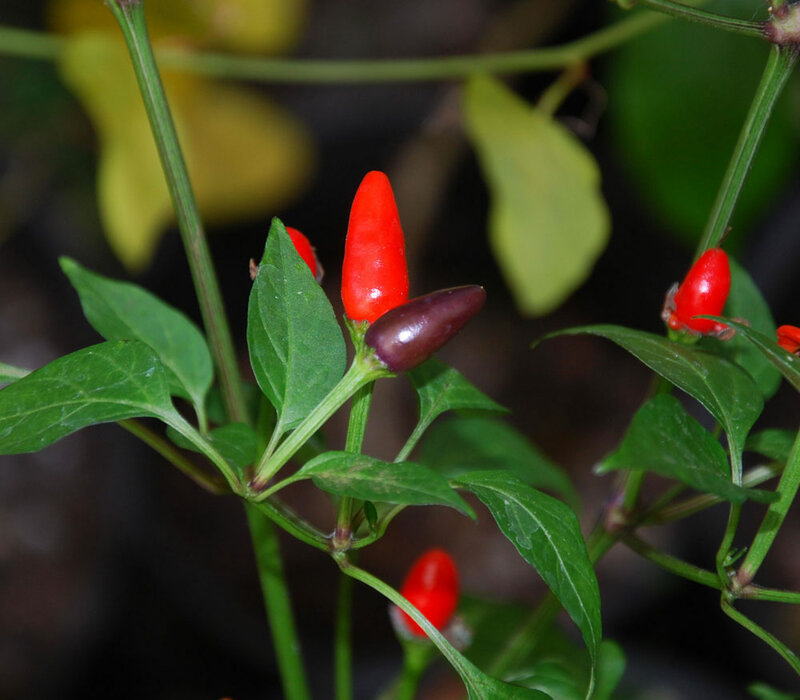 Although the species name annuum means ‘annual’ (from the Latin annus ‘year’), the plant is not an annual and in the absence of winter frosts can survive several seasons and grow into a large perennial shrub up to 1m (3 feet) tall. The species encompasses a wide variety of shapes and sizes of peppers, both mild and hot, ranging from bell peppers to chili peppers. 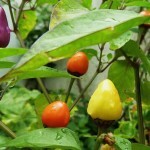 There are numerous varieties and cultivars of Capsicum annuum which are classified on the basis of their fruit shapes. Description: Capsicum annuum plants are prized for their bright coloured, fleshy, podlike fruit and is popular indoor species. They are bushy and low growing – 30-38cm (12-15 inch) tall and across. These plants bear fruit profusely. The stems are somewhat woody with thin, dark green branches carrying usually lance-shaped slightly hairy, green leaves 4-10cm (1.5-4 inch) long and 1-4cm (0.4-1.5 inch) wide on 1cm (0.4 inch) long stalks. White flowers are produced from leaf axils in early summer, but are insignificant. The fruit that follows the flowers usually remains decorative for 8 to 12 weeks after which it wrinkles and drop off. This species has been organized into five botanical groups of which only three – cherry, cone and cluster peppers – are familiar potted plants. Cherry peppers have berry-like, bright yellow or purplish white fruit 2cm (0.8 inch) diameter. Cone peppers have cone-shaped or cylindrical fruit up to 5cm (2 inch) long. Fruit colour may be green, ivory white, yellow, orange, red or purple and the colour may well change as fruit ripens. Cluster peppers have slender pointed 8cm (3 inch) long, red fruit which grow in clusters of two or three. Hoseplant care: Capsicum annuum are grown for the fruit and are discarded once the plant loses the fruit and the foliage becomes unattractive. The level of care needed to grow the pepper plant is moderately easy. Pinch new growth to encourage the stems to branch out and become bushy. Light: Capsicum annuum plants need bright light with at least three or four hours a day of direct sunlight. In inadequate light the leaves will begin to wilt and drop off prematurely. Temperature: Capsicum annuum do well enough in normal room temperatures, but the fruit remains decorative longer in a temperature of 13-16°C (55-61°F). For increased humidity stand pots on trays of moistened pebbles. Average room humidity is fine, but avoid too much dry air. Keep this plant away from drafts and heat vents. Watering: Water plentifully, as often as necessary to keep the potting mixture thoroughly moist, but never let pots stand in water. Feeding: Apply standard liquid fertiliser once a month during spring and summer only. Potting and repotting: Repotting is not required for these plants as they are discarded after the flowering season. Gardening: Capsicum annuum will not survive the winter frost in temperate regions and they are grown as annual plants. They do well as container plants and can be maintained over longer periods with indoor wintering, providing sufficient sunny location. These plants demand warm weather and do not like their roots disturbed. Position: Plant seeds in a sunny warm location in peat pots (3 seeds to a pot, thinning to 1 plant per pot) 6 to 8 weeks before transplanting into the garden after all danger of frost is past and night temperatures are consistently at or above 13°C (55°F). Plant in full sun outdoors. Soil: Soils must be well-drained, with optimum pH of 5.5–6.5, rich in organic nutrients. Avoid planting where Capsicum species (peppers), Solanum lycopersicum (tomatoes) or Solanum melongena (eggplants) grew previously. All three are members of the same family and are subject to similar diseases. After one or more plantings of any of these three in a particular location, carryover pathogens in the soil can infect new plants. 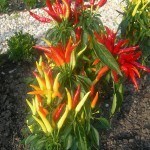 Plant Capsicum annuum in fertile well-drained soil 45 to 60cm (18-24 inch) apart in rows 45 to 60cm (18-24 inch) apart. Do not permit seedlings or plants to suffer from low temperature or drought. Add a 5 to 8cm (2-3 inch) layer of mulch around the base of Capsicum annuum plants once they have become well-established, after about three weeks of growth. The mulch layer will conserve vital moisture and control weeds that may compete for nutrients. Use bark mulch, hay or leaves. Irrigation: Water plants immediately after planting to settle the soil and encourage growth. Continue watering about once a week to keep the soil uniformly moist. Soak the soil to a depth of at least 15cm (6 inch) at each watering. Fertilising: Feed Capsicum annuum using 3 tablespoons 33-0-0 NPK fertilizer per 3m (10 feet) of row once the first fruit reaches about 2.5cm (1 inch) in diameter. Side-dress by applying the fertilizer to the ground several 8cm (3 inch) to the side of the plants. Fertilize capsicum once every two to three weeks using a high-phosphorus fertilizer after the fruit has completely set and continue until harvest time. Harvest: Harvest Capsicum annuum fruit when they are full-sized, firm to the touch and green or coloured. Cut the stems while harvesting instead of pulling to prevent breaking the brittle branches of the plant. Store peppers in the refrigerator for two to three weeks or freeze to increase the lifespan of your yield. Propagation: Capsicum annuum are raised from seed. Since it takes professional care to bring them to the flowering and fruiting stage for ornamental plants, however, this is not practical in the home. 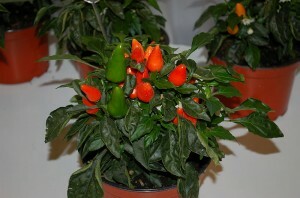 Capsicum annuum grown as indoor plant can be infested by spider mites in dry air conditions. Treatment: Avoid dry air by misting the foliage with tepid water to rise the humidity around it and prevent this kind or infestation. Use a suitable acaracide to control mites insects. Potential pests include aphids, white flies, cutworms, pepper maggots and Colorado potato beetles. Treatment: Use a suitable insecticide to combat these pests, following the indicate on the label. Repeated treatment will be necessary. Diseases include Verticillium wilt and mosaic virus. Note: Capsicum annuum should not be confused with Piper nigrum (black pepper) which belongs to a distantly related plant family (Piperaceae). Toxicity: The leaves and fruits of Capsicum annuum may cause indigestion and dermatitis. It is toxic only if large quantities are eaten. It can cause skin irritation. Avoid contact with eyes when handling Capsicum annuum. 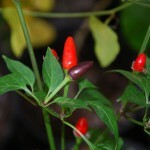 The fruits are eatable when raw or coocked, but most are fiery hot. 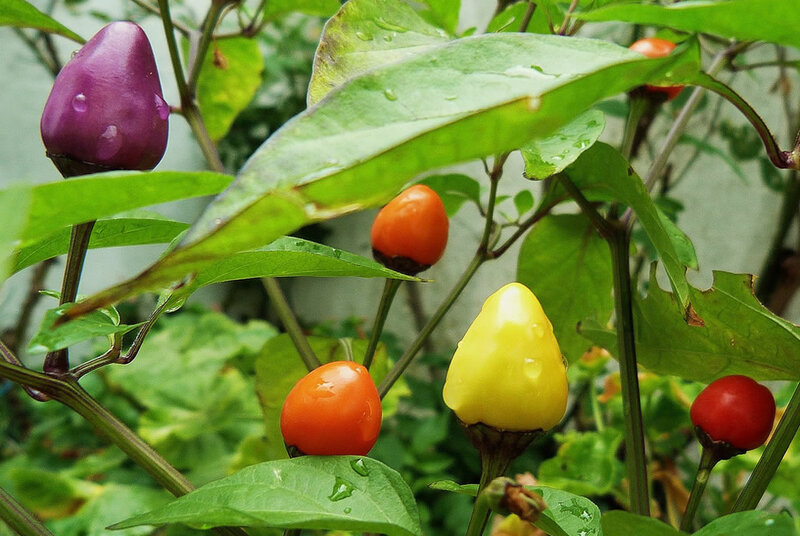 Uses and display: Ornamental varieties of Capsicum annuum (the fruits of which are also edible) are grown primarily for the decorative value of their fruit, often displaying fruits in different development stage on one plant. The popular ‘Christmas peppers’ were originally available at Christmas time and had green and red fruits. 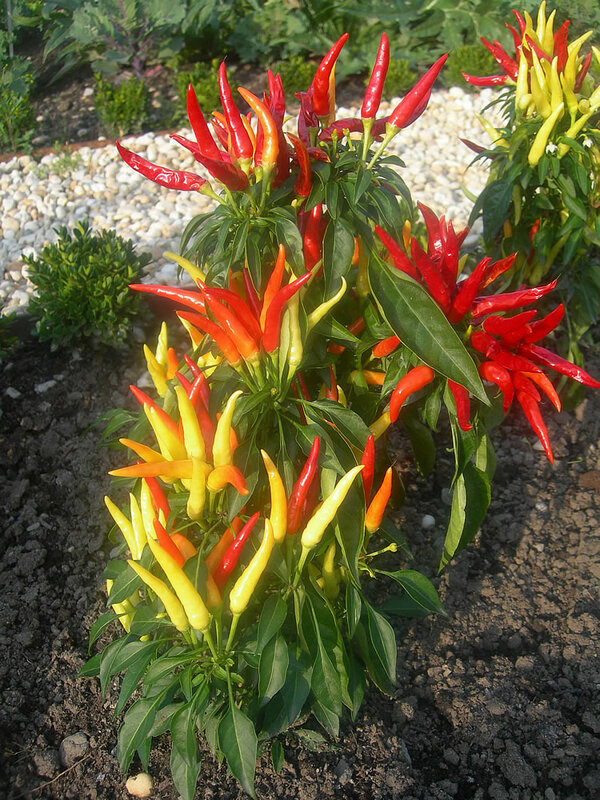 Capsicum annuum are also grown in gardens during summer and look attractive placed around borders or in containers.